The Toshiba Satellite Pro S500 is a no-nonsense laptop that's primarily aimed at business users. It has a large, 15.6-inch screen and an impressive range of ports and is available for around £630. It may be large and heavy, but the Toshiba Satellite Pro S500’s performance and impressive range of ports make this 15.6-inch laptop a good option for desk-bound professionals. 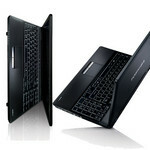 An affordable business-orientated laptop offering great battery life if not the last word in speed.